They call them vintage couples. But unlike wine, the portraits of these men were not made for later generations; they were never intended to age. The few that remain have been rescued, more like a flapper’s dress or an old army bicycle might have been. They have survived because of eccentricity or forgetfulness, a few perhaps out of willfulness. Countless others have been destroyed by family members anxious that no record be left of what was then an illicit love. Now they’ve been made a part of our time, dissolved into binary digits and recomposed to find their place in the frames of tumblr and flickr, though they show their age. Indeed, that is part of their charm. There aren’t many of these images, though more than I expected to find when I first started collecting. Some keep reappearing on sites I visit, like the icons of patron saints found in the workshops of confectioners and truckers’ cabs. Others travel less widely. Some seem commemorative in purpose. Formal portraits of two men in coat and tie, seated on a studio bench set before a curtained backdrop, the same drapes that would appear in the engagement photographs of their neighbors’ daughters and sons. A few strike a more daring pose. 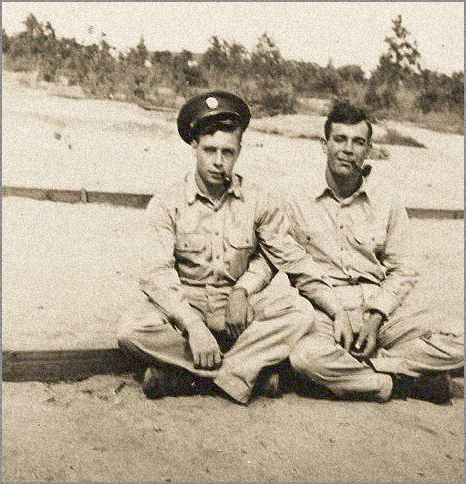 A man sits on his lover’s knee, his arm brought round his companion’s back to cup his shoulder. In another, two men, both in uniform, sit next cross-legged on the ground, their arms crossed over their laps to reach each other’s hand in a moving saltire of troth. The faces in these photographs never reappear. It is as if they have played only one role in their roles and this is it. If there are other photographs that continue the narrative of their love, they have remained in the keeping of family or friends or have been forgotten. Perhaps there is a trove of photographs lying in a coffer at a flea market stall waiting to be discovered, like fossils in a shale. But for now, the photographs we have are solitary specimens. Most of the pictures have no names. When they do, it is the equivalent of a “Chuck” embroidered on a vintage bowling shirt. But why should they bear names? They were never meant to be shared among strangers. The only thing certain about the men is their mutual affection. I am not even sure at times if they were a couple. The men on the picnic sprawled out on the grass—lovers on a trip out of the city, their first long weekend together? Or are they two just best friends on a late summer hike, posing for a farewell photograph before they return to their separate colleges? The affection is too palpable to be other than an index of love, I think. But I am not sure. These photographs are isolated finds, stripped of context and history. And that is the problem. One picture of a couple can tell a thousand stories, some more likely than others, yes, but all existing as possible narratives of parallel lives. A hundred pictures of the same couple would tell a single story. It would be a long story and it might be hard to put the pieces in exact chronological order. The men and women in cameo roles would be hard to identify. In places the story would be sketchy in detail—why is his arm in a sling? Why is the dog covered in tar?—but by and large you could trace the outline of their life together. If you found such a trove you could plot the photos along time like notes on a staff, and they would yield the score of a relationship. You could hear the oft repeating notes of the basso ostinato, the lover puttering in the garden, the other forever reading, the frequent presence of dear and constant friends. And then you’d hear the musical phrases of ski trips and stone churches, of fried clams and beer, and the cheap hotel in Flanders where the two caught lice. There would be long rests in the score, too, the lacunae of illness and domestic ruts. But the photographs of vintage couples are like notes of a song whose score has been lost. They have been salvaged, though we don’t know what the melody was like. Did they get fat as they grew older? Did they buy a cat? Go to Rome? We know nothing except that this love was indeed once sung. We should be grateful for even these snippets, though. We are lucky to have them at all. The washed out greys of these old scratched and faded photographs may speak to another less hectic, less cynical time, but the innocence is deceptive. 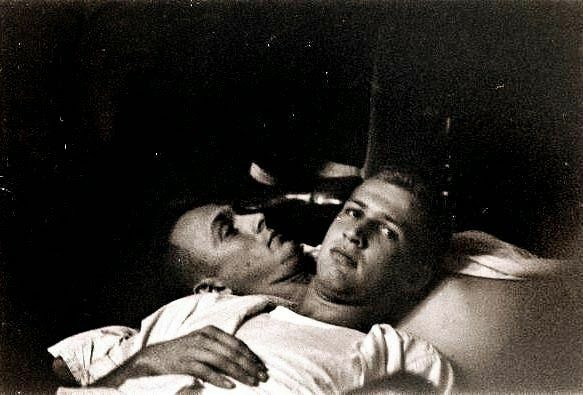 Our eyes, now more accustomed to the embrace of two men or two women, fail to perceive how daring these photographs were at the time, and how rare they must have been. Time has rendered them innocuous. They are like a talisman drained of magic that now lies inert in a museum display case. They have become curios, sweet mementos that point to a history we know little about. We forget that the men in these photographs could have been jailed for the love they so tenderly express before the camera. Our daily life has become an endless series of photo ops, and we are never without a camera to make use of them. We just need to slip our hand into our pocket and take our phone and the moment is recorded. Our camera has become an extension of thought. See it, shoot it. But for earlier generations taking a photograph was an occasion in itself, if only because someone had to remember to bring a camera and film. It was even more an occasion for these lovers. Who took these pictures of men embracing at the water’s edge, of naked torsos pressed together and legs intertwined? The pictures of lovers on the rumpled sheets of a summer cot? A close friend, perhaps, or a like-minded photographer? A person they could trust, in any event. Such pictures could change a life and compromise their subjects, even if some of the men in these photographs were out to their friends and family. The camera would not steal their soul, but it could command their future. How great, then, these men’s desire to distill their love into an image they could hold in their hands. To document their love and say, yes, I lived this. I loved this man. What could not be enacted in public—the clasp of hands, a caress—could be embodied on film. The photo booth was safer, though that would come later. There weren’t many kinds of pictures you could take in a booth, but the kiss was one of them. The booth, no larger than a broom closet or a confessional, was for most men the only way to even capture a kiss on film and the closest they would come to kissing in public. If they had looked under the booth’s curtain they would probably have seen the shoes of strangers as they passed by. Inside the still darkness of the curtained booth, they would be invisible save to the camera’s lens. This anonymous eye would look at them for just an instant, record their kiss and then forget about them forever. It would keep no negative—that now obsolete currency of blackmailers—and would thus reveal no secret. The prints would remain, guarded from the eyes of family members who wouldn’t understand. A few would survive the passing of the lovers whose kiss or embrace they recorded, and these would become part of a history, recondite and for the most part still unrecorded, a history of men who loved other men. Soldiers on a beach. Photographer unknown. I didn’t know in high school that I was part of this history. Ironically, I was not only displaced from the world of my straight classmates but also cut off from a lineage of men very much like me, or men I would have wanted to be like if I had known. I was a case of one. Later as I was coming out, I began to read the accounts of the life of gay poets and writers and artists, the stories of Cocteau and Marais, and others like them. But only much later was I to read of the lives of less illustrious lovers, whose stories are the purview of historians and collectors. The photo booth kisses are lovely but I am more moved by the pictures of couples lying on the summer grass or huddled up on the beach, ordinary pictures of ordinary men. They are among the most tender and beautiful. They are beautiful to look at. I feel as if I have chanced upon a photograph of a distant ancestor, in whose features I can discern the traits of a more familiar face. Mine. Many of these photographs have been collected on the Homo History blog. It is an inspiring place to visit. The idea of family photographs as a score of music is not mine, but comes instead from the artist Panos Mattheou and his installation “Once Upon a Song”. In this piece, Mattheou selected a hundred or so slides from a much larger cache of family slides that he had found in a storage box at a flea market for €5. He digitized the slides, arranging them in rows—much like notes on the lines of a conceptual staff—as a timeline along a wall. A row for photographs of the man, another for the couple and their friends (they seem not to have had children), another for travel, yet another for an odd series of foliage pictures (I assume one member of the couple was an amateur nature photographer). Mattheou used the digital data of photographs in which the characters of this family chronicle appeared as input for the production of a sound track. The timeline tells a visual story of the family (or rather, the artist’s narrative of the couple’s history), and the soundtrack the story in song. A most intriguing work.